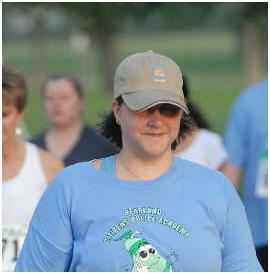 Michelle talked me into signing up for the Pear Run this year. The run was on May 9th, Father’s Day, at 7 AM. Since my Dad was in North Carolina, I didn’t have many plans for that day, so I figured “why not?”. Thankfully, Mike came with me. I’m not very familiar with Pearland, so I was glad he was driving. Just as with any other race, I was getting quite nervous as everyone was lining up. The course started at Independence Park and wound through a subdivision. I didn’t have a chip this time because I signed up as a walker instead of a runner. The shirts were really cute! 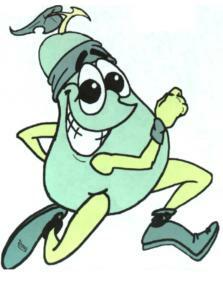 I love the little running pear. This was me as we started off the walk. I was feeling really good and enjoyed watching the different runners cross the streets ahead of me. There were several people standing outside of their houses. Some cheered us on, most looked at us like we were crazy. Nothing quite like running in a subdivision for gawking eyes! Me at the end of the run. Mike’s shirt is darker because he was sweating up a storm! I don’t remember my exact time. I wish I would have written it down somewhere. But, I think I finished around 50 minutes. Such a handsome and ticked off man! He hates having his photos taken and it looks like this photographer was right at his face. Mike finished at 21 minutes and 45 seconds. He consistant with his times! I have pictures of Michelle and Jesse from this race, but I won’t post them because I’m pretty sure they wouldn’t want me to! But, I will post their times. 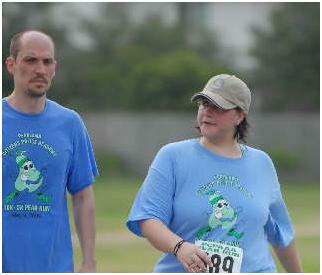 Michelle finished in 32:08 and Jesse finished in 36:53. Good job guys! 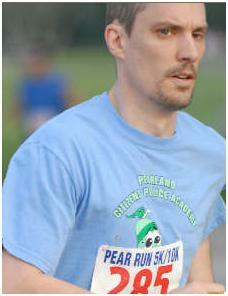 This entry was posted in Races and tagged Pear Run, Race on December 31, 2009 by Tammy.